The Velo29 Altura Stockton Grand Prix Road Race showed what putting a top level race on a competitive course can yield – a mega awesome race! 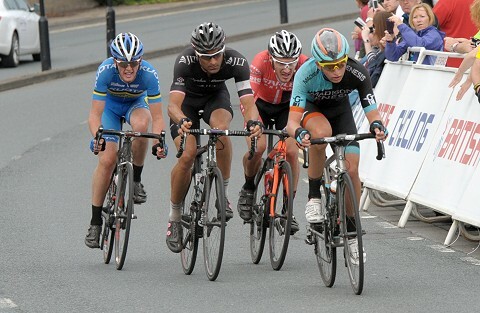 It was won by Russell Downing who boarded the Russell Hampton train from peloton to break, then closed down a lone move by Rhys Lloyd within half a mile and to top it all off, won the sprint by so many lengths I’ve lost count. 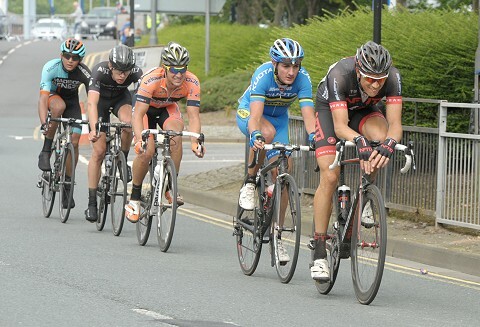 Russell Downing wins the Velo29 Altura Stockton GP with ease – his form in the race was scary good! 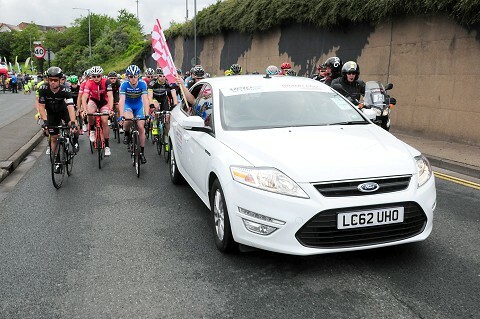 The race was on from the gun and with 57 miles covered in the first two hours, that shows just how quick it was. Breaks were coming and going and on the second lap, 30 riders found themselves detached from the peloton and it was race over within 30 miles. At the front, a big group of two dozen or so got away with all the top teams, and many a race favourite in it but Pedal Heaven closed that down only for a smaller break to get away. 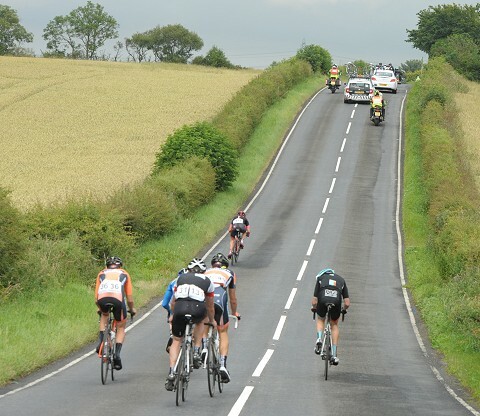 Richard Handley, Alex Peters (Madison Genesis), Hugh Wilson (NFT0), Matt Cronshaw, Rhys Lloyd & Adam Martin (both Metaltek Kuota) got a gap and it was left to Raleigh to chase. 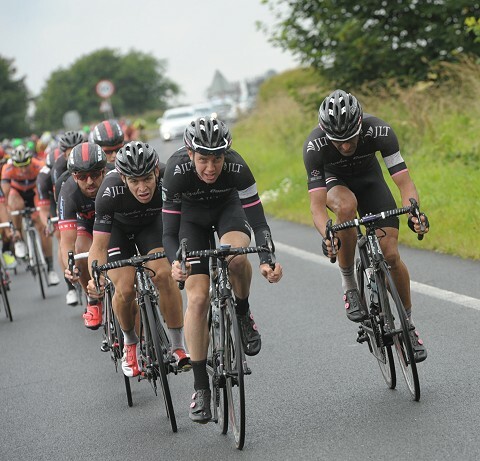 Problem was for the other teams, the break were working well and soon had a three minute gap and it wasn’t until the final few large circuits that Rapha Condor JLT realised the problem and the speed sky rocketed as the men in black chased flat stick. Other teams joined in and the gap was coming down but this wasn’t WorldTour and the leaders were holding off the chase and it wasn’t until the final lap of the finishing circuit that the gap came down well under the minute. 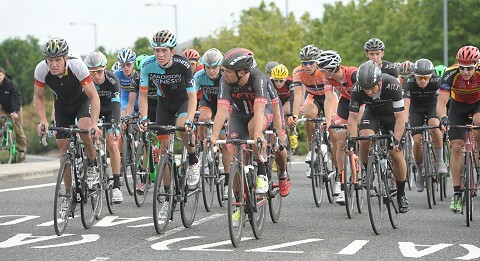 A small chase group had been caught and Russell Downing had got across to Liam Holohan who was on his own. 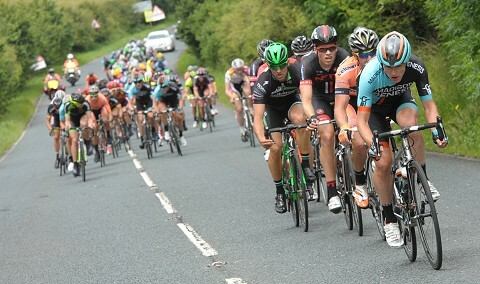 Then ‘big power’ Russell Hampton jumped clear of the peloton and said to Rus, ‘come on’. Downing at first had to sit in as he had a rider up the road (Hugh Wilson) but Hampton carried on and once it was clear he was going to catch the break, Downing got stuck in. He and the NFTO team were happy to leave it to Hugh Wilson but as Hampton was closing down the break, Downing spoke to Hugh and asked for a leadout. 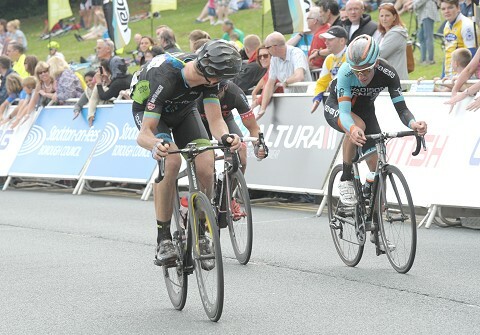 Rhys Lloyd threw a spanner in the works with a lone move on the last lap but it was closed down and the next we saw was Downing well clear of the peloton, raising an arm in celebration. 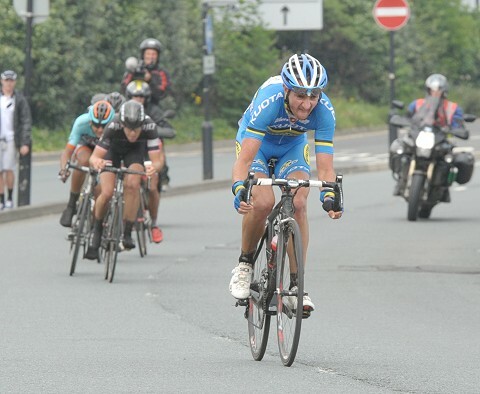 Rus Downing makes his move to chase down Liam Holohan up the road …. After breaking his collarbone in the Lincoln GP, the ‘Fonz’ was back and how! 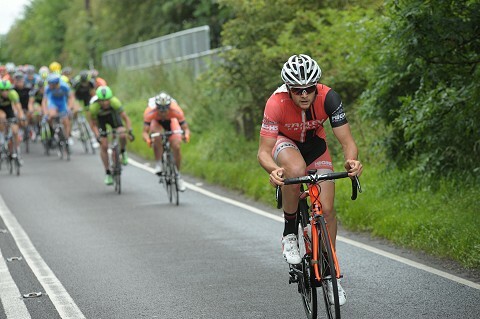 Rus Downing, the NFTO policeman, chasing anything that moved off the front due to having a rider in the break. 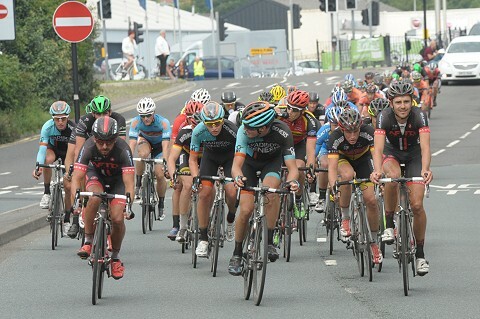 Adam Blythe looks across at a South Yorkshire legend, John Tanner at the front of the peloton as the races enters Stockton. 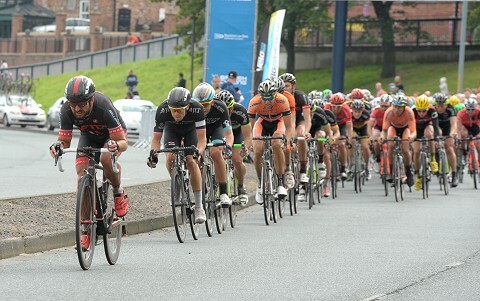 This was an example of ‘scary’ Russell Downing. 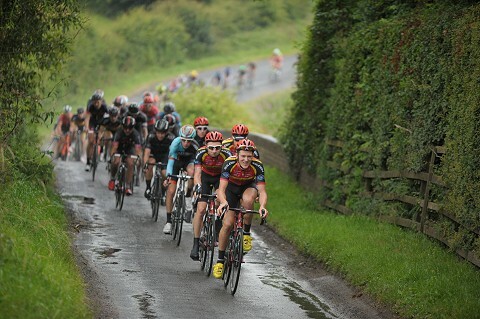 A chase group was gaining on a group ahead and he jumped them and crossed the gap on his own. Yes, the legs were very good today Fonzy! With the break’s lead having gone out to three minutes, the men in black got on the front and were going flatstick chasing for a while as well as throwing in few breaks from Graham Briggs as well. Kristian House leads a move that had so many favourites and teams in it, and was shifting big time, that it was a surprise it was brought back. 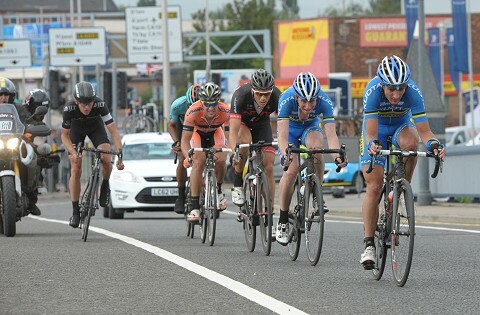 Peter Hawkins leads a move early on in the race that didn’t stick. 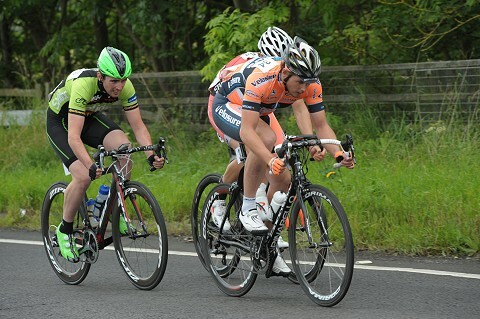 Tommy Bustard leads one of the first moves off the front.